Somerset team manager Garry May has turned to the man that knocked his Rebels out of the league title race as he looks to try and pick up some silverware this season. Poole Pirate Chris Harris delivered the crushing blow in heat 30 of the play-off semi-final to charge by Jason Doyle in one of the most memorable play-off races ever, a move that sent Poole into their 10th play-off final where they subsequently beat King's Lynn on Wednesday night, with a heat to spare, to secure their 10th all-time top flight title. With the Rebels losing the services of Jack Holder after he sustained muscle damage to the shoulder during that play-off semi-final, May has been forced to look for reinforcements for the cup final next week when they meet King's Lynn at the Oaktree Arena on Wednesday before concluding their 2018 campaign in Norfolk 24 hours later. 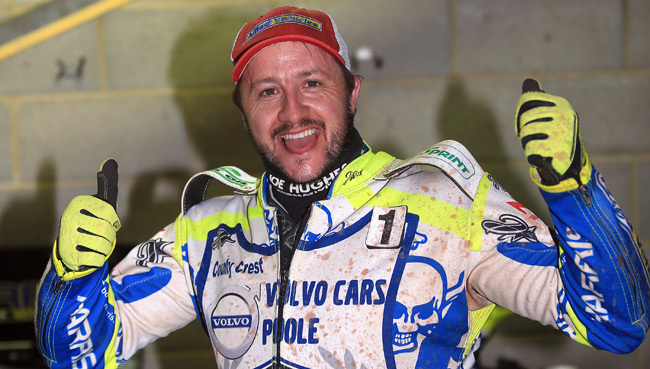 May explained why he went for the man that ended his league title aspirations "That ride was just an absolutely incredible move and it is those sort of races that are great for British Speedway. I think it spoke a great deal of what sort of rider Bomber is. He never gives up, never beaten until the chequered flag. So once it was confirmed that Jack was forced to miss the final I immediately pencilled him in as an option. Unquestionably he is one of those riders that you know will give his all to the cause and now he has a chance to do his own mini-double by winning the cup with us to add to his league championship medal." The Rebels co-promoter has further confirmed that both Bradley Wilson-Dean and Aaron Summers will also miss the cup final. Wilson-Dean is still affected by the remedial operation he had on his shoulder to remove the metalwork he had been carrying in it all season, whilst Summers has a break in his wrist. May revealed "It is a great shame that we will be reduced to just four of own for the final. We will have a second guest alongside Bomber and run rider replacement for the other position and I will be confirming which way I will be going shortly."